the cross-shaped laying tool and the floor tile especially foamed onto the flooring. 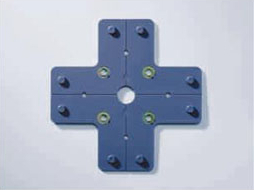 The cross-shaped laying tool has special bevelled knobs which have the function of adjusting the floor tile properly. 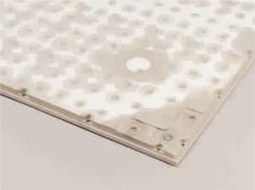 The floor tile is foamed onto the back of the surface material and forms the counterpart of the cross-shaped laying tool. 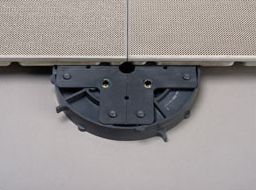 An indentation in the area of the floor tile guarantees that it rests on the whole surface. 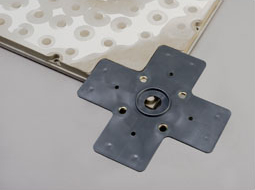 The cross-shaped laying tool is put onto the corner of the tile thus connecting the tiles. After laying the first tile, the others are simply pressed into place from above. Laying the tiles with staggered joints is also possible.